GetDivorcePapers.com provides professionally completed, 100% court-approval, money-back guaranteed New Hampshire divorce forms. Just create an account, complete the interview, and file for divorce. Our case managers do all the work for you, and send the completed New Hampshire divorce forms when they are ready to be filed. 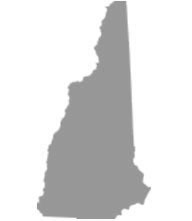 In order to get the divorce in New Hampshire, it is necessary for both the spouses to be the residents of this state. Else one of them has to be resident in New Hampshire for at least one year immediately prior to filing the case. If none of the above conditions fulfills, then only one is left behind that the cause of divorce should have happened in this state and one of the spouse needs to be living here when the divorce has been filed. Papers can be submitted into any county where the two spouses live. New Hampshire deals with no-fault as well as fault based reasons for the divorces. In both cases, both of spouses are required to agree with the reasons and must substantiate them later on. No-fault reason includes the irremediable loss to the marriage which can be due to the differences in the sect. Separation for more than two years. New Hampshire gives the joint custody of the child to both of the parents if it turns out to be the best solution. Following factors are involved in decision of the child custody. Decision of the child and his decision making ability. Suggestions made by a neutral individual. Symptoms of the child abuse. It there is found the symptoms of the child abuse then joint custody is not given unless the convicted parent goes through the proper counseling. In the same way, time to time custody arrangements are assessed for the frequent meetings of the non-custodian parent with the child. New Hampshire is an equitable distribution state and divides all the properties of the spouses including the separate properties, gifts, inheritances, and marriage properties. Following factors are considered in division of the property. Age, health conditions, and occupation of spouses. Employment chances of the custodian parent. Role of both spouses towards the acquisition of property as well as towards the child nurture. Tax liability on both spouses. Value of properties, gifts, and inheritances. Economic conditions of both spouses and prevailed circumstances. Spouse in need lacks sufficient property to meet his or her needs. Spouse to pay has sufficient resources to pay for the alimony. Spouse in need has to fulfill the responsibility of a child in his or her custody and is unable to seek for employment. Health conditions of the spouses and their ages. Skills and education possessed by both spouses. Tax effects after the division of property. Worth of property possessed by each spouse. Contribution made by either spouse towards the welfare of family. Status and living standards of each spouse. Basic as well as extraordinary expenses required by the child. Economic effects of any stepchild adopted by either of parents. Arrangements for the shared custody. Expenses required for the secondary education of child. Courts may order to pay the child support in the form of insurance coverage. Court can order for the mediation for the spouses if it feels the chances for the reconciliation among the two spouses. However, this mediation can also be requested by either of the spouses. There is no need of a lawyer when applying for divorce in the state of New Hampshire. A divorce case which is filed without any help of an attorney in any of the states is known as Pro Se Divorce. Literally, Pro Se is a Latin phrase and it means "on her or his own". Process of getting the divorce without the help of lawyer may vary from one State to another. These types of divorces are perfectly legal and enforceable in New Hampshire, and are actually very convenient. Usually, once settlements have been made regarding property distribution and custody matters among the spouses in case of a mutual divorce, Pro Se Divorces are filed.